Viliame Liga was the dominant force in javelin in Fiji for 20 years and was one of the region’s greatest Javelin throwers in the 60’s and early 70’s. His National Record of 72.09 metres, set in 1966, stood for more than 20 years, and may well still be standing, were it not for a change in the javelin in 1988. 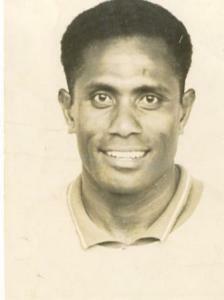 Liga took part in the first South Pacific Games held in Suva in 1963, winning Fiji bronze medal in javelin. In 1966 he won a silver at South Pacific Games held in Noumea, than a bronze each in javelin and discus during the 1966 Games in Papua New Guinea, and in 1971 placed forth in the javelin during the Tahiti Games. Liga also participated in the high jump and hammer in South Pacific Games level, emphasising the all – round nature of his athletic talent. Liga represented Fiji at the 1954 and 1958 Empire Games and the 1962 Commonwealth Games, placing in the top eight in each case, and in 1968 he represented Fiji at the Olympic Games in Mexico City. Viliame Liga’s record is evidence that he was one of the greatest athletes Fiji has ever produced. After his retirement in 1975, he continued to provide advice and encouragement to young athletes, and was a tower of strength to athletics in Fiji. Liga passes away in Brisbane in 1986 at the age of 54.